You’ve likely heard news reports this week about the swine flu virus outbreak in Mexico. The swine flu or swine influenza produces regular outbreaks of respiratory disease in pigs and is caused by influenza type A viruses. Transmission of swine flu viruses between people has been reported in the past, but was limited to three people. Today, the World Health Organization (WHO) raised its pandemic alert to "phase 5", which means that people in at least two countries in one WHO region are spreading the disease . This was done following an increase to "phase 4" several days ago because the virus was already widespread in differnet locations, with confirmations in Mexico, the United States, Spain and Scotland. While the Centers for Disease Control and Prevention (CDC) has determined that the swine flu is contagious and is spreading from human to human , the WHO has indicated that most people infected with swine flu make a full recovery without the need for medical attention or antiviral drugs . As of today, the U.S. has reported 91 laboratory-confirmed cases of the swine flu and one death . Mexico has reported 26 confirmed cases with seven deaths; Austria (1), Canada (13), Germany (3), Israel (2), New Zealand (3), Spain (4) and the United Kingdom (5) have all reported laboratory confirmed cases (number in parenthesis) with zero deaths . Public health agencies around the world, including the CDC and the WHO, are monitoring the spread of the swine flu and focusing on mitigation measures. That means providing information on social distancing interventions, including case isolation, school dismissal and childcare facility closure . In terms of preparations and informing the public, U.S. officials agencies are already treating the swine flu outbreak as a "phase 6" event to stay ahead of the WHO . In a CDC briefing yesterday, acting CDC Director Richard Besser said the following . What we see in the United States, or have been seeing so far, has been milder, has been less severe than what has been reported out of Mexico. And as we continue to look, we will continue to monitor that. So there are five hospitalized cases, three in California and two in Texas. The median age is 16 years to 64 years. We expect to see more cases and will continue to report on those. As we move forward, we may start to move away from specific case numbers and more on to describing states and clusters. The incubation period in the United States appears to be about two to seven days, which is typical for what you see with an influenza virus. I want to take a moment and put this into context with seasonal flu. Many of you are well schooled in influenza and have been covering seasonal flu. But what we see with seasonal flu is that it can be unpredictable. On average, in the United States, each year from seasonal flu, we see approximately 36,000 deaths. And so influenza is a severe infection. It affects different people differently based on their own immunity, their ability to fight infection and factors around the virus. As this moves forward, I fully expect that we will see deaths from this infection. They’re seeing many deaths in Mexico, and we’re trying to learn more about that and why the situation in Mexico is different from here. And as we continue to investigate cases here, I expect that we will see deaths in this country. Indeed, seasonal flu in the U.S. hospitalizes over a quarter of a million people annually and kills 36,000 every year . Scientists hope to someday develop a vaccine that provides lifetime immunity from the flu. Until then, annual vaccinations are important in the fight against the flu. Note however that none of the annual flu vaccines were specifically targeted toward swine flu. In the midst of alarming reports on swine flu that are bombarding us from the media as well as all the misinformation circulating on the Web, some science-based information is in order. The swine flu, or more generally the influenza virus, is a respiratory infection caused by a variety of RNA viruses. 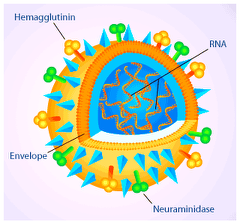 Influenza A is an RNA virus that causes influenza in birds and some mammals, including swine (pigs). The virus uses two cell surface proteins to mediate entry and exit from host cells and is subclassified according to the viral proteins used. The protein hemagglutinin (pronounced hem-a-gloot-nin) allows the virus to bind to the cell that is being infected: there are 16 different hemagglutinin subtypes (H1 — H16). The protein neuraminidase (pronounced neur-a-min-i-dase), an enzyme that cleaves sialic acid from host and viral proteins, facilitates viral exit from the host cell: there are 9 neuraminidase subtypes (N1 — N9). All known strains of influenza A are made up of combinations of hemagglutinin and neuraminidase subtypes. The swine influenza A virus subtype is H1N1. Using hemagglutinin, influenza viruses bind to sialic acid sugars (essentially a carbohydrate widely distributed in animal tissues in and bacteria) located on the surface of epithelial cells in the nose, throat and lungs. The cell then absorbs the virus in a process called endocytosis. Once inside the cell, the virus replicates. The presence of the influenza A virus isn’t a surprise. The most-recent U.S. virus surveillance found that influenza A accounted for over half (67.3%) of all influenza viruses identified; almost all influenza A viruses (89.9%) were the H1N1 subtype . What’s surprising is how severe the cases have been in Mexico, and it’s something the CDC is looking into. How is the swine flu transmitted? Like any other flu virus, the swine flu is transmitted primarily by air. Simply coughing or sneezing, or through direct contact (shaking hands or kissing) can spread cold and flu germs. One of the most effective ways to prevent illness is to wash your hands. You cannot contract swine flu by eating pork or pork products. The virus is killed by cooking temperatures of 160 degrees F / 70 degrees C .
There appears to be a greater prevalence of stomach symptoms with the swine flu, including nausea, vomiting and diarrhea. What if I get sick from the swine flu? Since October 1, 2008, none of the influenza A viruses tested in the U.S. were resistant to both oseltamivir and the adamantanes, and all influenza viruses tested this season have been susceptible to zanamivir . The swine flu virus is sensitive to both oseltamivir (Tamilfu) and zanamivir (Relenza) . Antiviral drugs reduce the severity of illness, make you feel better faster and may prevent serious complications. How can I protect myself from the swine flu? Wash your hands frequently or use an alcohol-based hand antiseptic. Get plenty of rest, drink plenty of fluids and eat nutritious food. Avoid touching your eyes, nose or mouth. These are areas where the flu can enter your body. Avoid people that are sick. If you get sick, stay home and limit contact with others. WHO Raises Swine Flu Alert; Virus Claims First Life in U.S. The Washington Post. 2009 Apr 29. Swine Influenza and You. Centers for Disease Control and Prevention. Accessed 2009 Apr 28. Swine influenza frequently asked questions World Health Organization. 2009 Apr 27. Swine Influenza (Flu). Centers for Disease Control and Prevention. Accessed 2009, Apr 29. 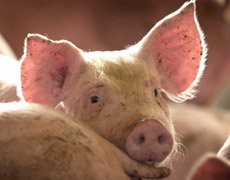 Swine influenza – update 5. World Health Organization Disease Outbreak News. 2009 Apr 29. Interim CDC Guidance for Nonpharmaceutical Community Mitigation in Response to Human Infections with Swine Influenza (H1N1) Virus. Centers for Disease Control and Prevention. 2009 Apr 28. CDC Briefing on Public Health Investigation of Human Cases of Swine Influenza. Centers for Disease Control and Prevention press briefing transcript. 2009 Apr 28. Fiore et al. Prevention and control of influenza: recommendations of the Advisory Committee on Immunization Practices (ACIP), 2008. MMWR Recomm Rep. 2008 Aug 8;57(RR-7):1-60. Update: influenza activity–United States, September 28, 2008-April 4, 2009, and composition of the 2009-10 influenza vaccine. Centers for Disease Control and Prevention (CDC). MMWR Morb Mortal Wkly Rep. 2009 Apr 17;58(14):369-74. Antiviral Drugs and Swine Influenza. Centers for Disease Control and Prevention. Accessed 2009 Apr 29.